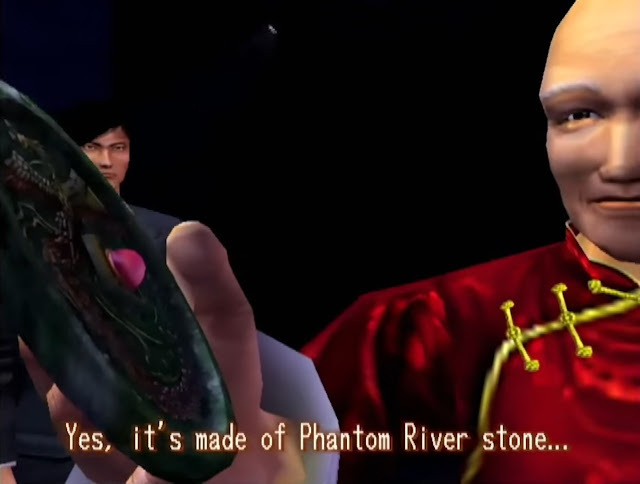 The mysterious mirrors that lie at the heart of the Shenmue story were crafted from a substance with an equally mysterious-sounding name: "Phantom River stone". (Which is, of course, from where the name of this blog was taken). Now, although its name is Phantom River stone in the English Shenmue games, in fact this differs slightly from its Japanese name in the games. In this post we'll look at what it is called in the Japanese version of Shenmue. Ryo first hears the name of this stone from Master Chen after taking him the Phoenix mirror he discovered hidden at his home. Ryo also later learns that the stone is also particular to a very specific area, namely Bailu village in Guilin. Master Chen (English version): "Yes, it's made of Phantom River stone..."
Master Chen identifies the stone (English version). 洮河 = Tao River (sometimes written as Taohe River). The meaning of Tao is "cleansing". ...which gives us the meaning in Japanese of "Tao River green stone". Although the stone is called "green stone", this does not necessarily refer to actual greenstone (i.e. jade), but rather it more generally describes green-colored stone since there is a separate word for greenstone in Japanese: hisui (翡翠). Master Chen also describes the stone using the word maboroshi (幻) that, in this context, can be taken to mean "extremely rare" or "fabled". 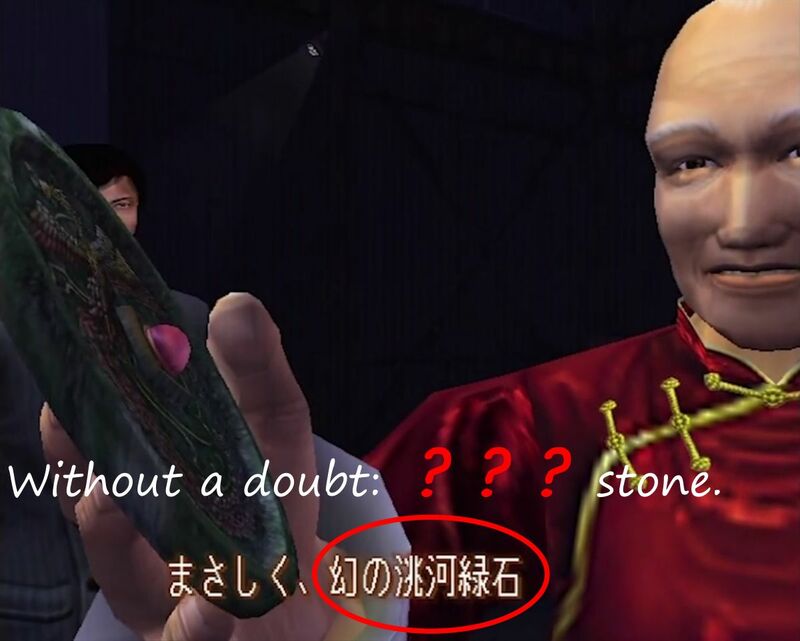 Master Chen (Japanese version): "Without a doubt: the fabled Tao River green stone." Master Chen in the Japanese version: "Without a doubt: the fabled Tao River green stone." Notably, it also literally means "phantom". This is surely not a coincidence, and must have served as the inspiration for its name in English. This word is not a part of the stone's actual name in the Japanese game, however. 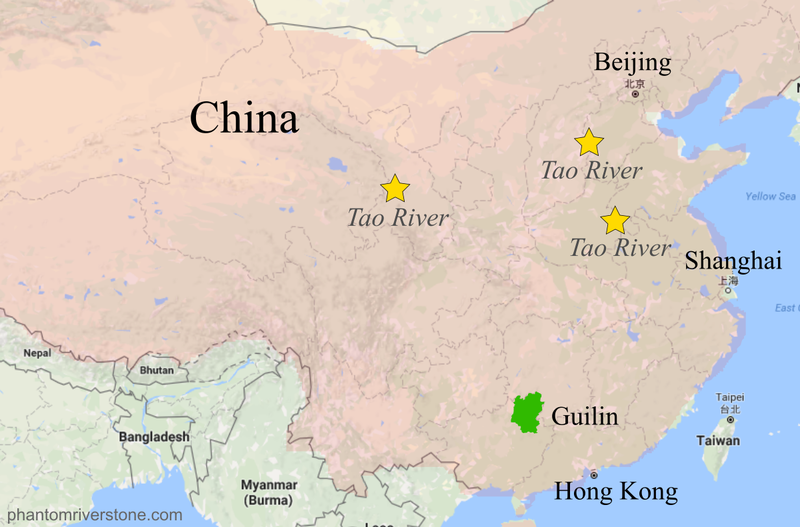 Examining a map of China turned up a total of 3 rivers named the Tao (洮). Three rivers named Tao within China (marked with a star). However, as can be seen on the map, these rivers are located far to the north of the Guilin region and Bailu village. Google Maps is obviously due for an update! In any case, this completes our brief comparison of the name in each language. Although the English version differs from the Japanese version of the name, the translators chose well in settling on "Phantom River stone" for the English name of the stone, as it lends it an enigmatic aura. This topic was suggested by Trent, webmaster of the excellent French Shenmue fan site Shenmue Master. It's in gansu region of China, I'll send you a rough translation later! Nice find! So a stone with that name actually exists in China! Would love to hear more about it. Around the first Tao river on the blog map, I guess, if it's in the Gansu region? Wouldn't it make a cool addition & story for a Shenmue collection.